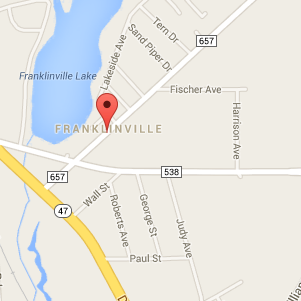 Franklinville NJ is one of our favorite places to work, an unincorporated community situated within Franklin Township in Gloucester County. Our team can install new siding, put on new roofing, replace your windows and so much more.Homecraft® Inc. is the trusted home improvement provider of Franklinville NJ offering roofing, siding, replacement windows and gutters. We put a focus on high-quality workmanship, materials and products constructed to last decades, plus we ensure you enjoy one-on-one attention built on three decades of experience. This all makes Homecraft® Inc. the top company among Franklinville NJ homeowners. Our replacement windows come with the widest selection and highest quality available. Whether you choose our own Homecraft® vinyl replacement windows, or our Andersen® wood replacement windows, you will be treated to superior performance, guaranteed energy savings, and many years of reliable service. From strong weather-resistant storm doors to state-of-the-art automatic garage doors, we can help improve the function and appeal of your home. Count on our knowledge and skills to design a brand new entryway for you or even some smooth sliding doors for your patio. Our process is easy: browse through our inventory to choose the traditional look of cedar shake siding ideal for frame-built or Cape Cod homes, or vinyl siding for a modern, sleek look that doesn’t take much upkeep. Unlike lots of other siding contractors who claim to give you options, we clearly do. With a wide variety of siding materials, textures, styles and colors at your disposal, we give you the best value for the money. There’s no doubt about it: you should rely on Homecraft® Inc. for roof repairs and new roofing in Franklinville NJ! In fact, we are GAF MasterElite™ roofing contractors, installing roofs built to last. Shielding your home and property from damaging rain is vital, which is why you need a superior gutter system in Franklinville NJ. You can count on Homecraft® Inc. for our built-to-last gutter systems that divert flow due to rain, snow, or melt-off from ice. Turn to us to replace worn parts, repair damage, and make smart home improvements on your Franklinville home. We are here to offer you ideas, designs, and top quality installation of all your home improvements. FREE Estimates on Franklinville NJ Home Improvement, Windows, Doors, Siding or Roofing. Call Homecraft®, Inc., today at 1-877-494-0377 to schedule a FREE in-home consultation and estimate for your Franklinville NJ home improvement project, roofing, siding, replacement windows, doors, or gutters.